The Library Area in North Andover, MA is located within the boundaries of Massachusetts Ave, Waverly Road, Main Street and Route 125. The neighborhood is within walking distance to schools, the library, church, the park and town center. The Library Area neighborhood and homes are a throwback to the 50’s. There’s a wide variety of home styles; capes, ranches, colonials, as well as some newer homes. The lot sizes vary, they’re typically smaller, about one third of an acre to an acre. This is a classic neighborhood where everyone walks to school together and all know one another. Find out what your Library Area Home is worth now! See recently sold homes in the Library Area now! 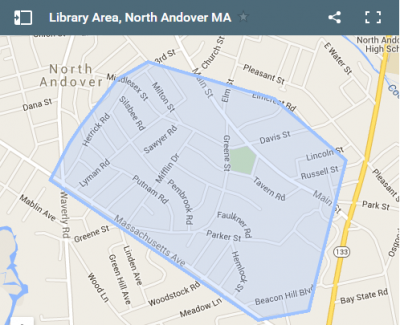 We live in the Library Area in North Andover and love it! We enjoy the family neighborhood, friendly neighbors, seeing our daughter outside playing with friends, the conveniences of being within walking distance to town, school, the library, and the park. See More Homes For Sale in North Andover MA!